Members of the Ardentinny Heritage and Conservation Group have planted saplings at the Village Hall and Coronation Wood as part of a mass countrywide tree planting organised by the Woodland Trust with support from Sainsbury’s, IKEA FAMILY, players of the People’s Postcode Lottery and Yorkshire Tea. Seven volunteers planted 30 trees including Crab Apple, Hazel and Hawthorn. The trees were planted to enhance the areas and provide food for wildlife for many years to come. The volunteers met on a lovely sunny November morning to plant the trees and were rewarded with hot soup and cake sitting under the more mature trees in Coronation Wood. Thanks go to the band of volunteer planters and the Woodland Trust Scotland for the free trees. Over half a million native trees from the Alba nursery outside Edinburgh have been distributed throughout the UK this month – including 54,300 to Scottish Schools and community groups. The Woodland Trust’s single biggest distribution of free trees. 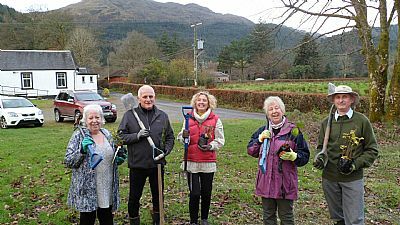 The photo shows some of the volunteers ready for action with spades and saplings at the Ardentinny village hall car park.